Watching birds and watching me. Calls his mate come sit beside. Chuckling on this sunny day. Cat’s around and they can tell. Antics make the children laugh. Proudly let their plumage show. Birds watch their departing foe. Glad to see this hunter go. They’ll return the day to greet. We had some monkey pets in India. They were very entertaining. Yes it’s nice to have pets in the home. Thank you. It is a pleasure to have animals as part of a family. You have just described my backyard, Ian. We have cane all around and Mt. Warning looks down on us. 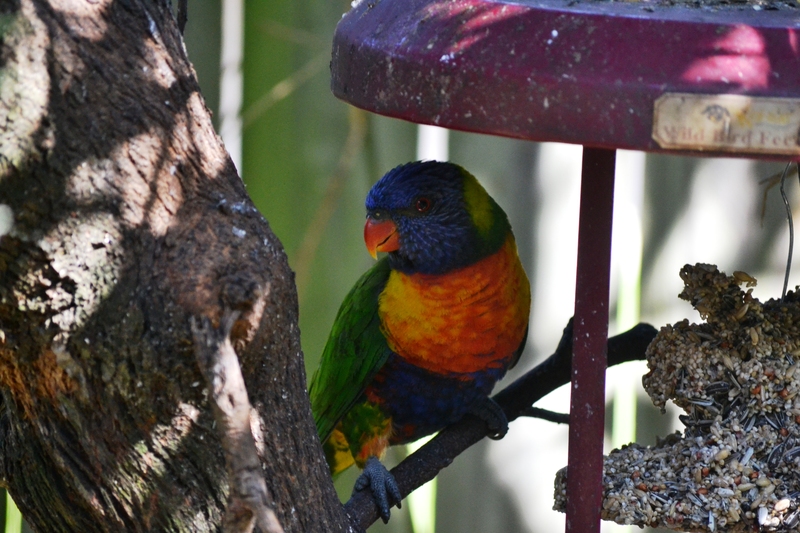 I have a favourite Willy wagtail and a ‘couple’ or so of lorikeets and various parrots. Love birds but am hopeless at catching them on camera. No patience I guess. Lovely poem. Thanks. Sounds like you live in a beautiful environment. Lucky you! We have some noisy neighbours that far outclass the noise from our feathered friends. LOL. Yes it certainly is animal kingdom here, but our home has always hosted animals of every kind including monkeys in India. Sorry for the delay in responding. I’ve been undergoing medical tests and not been on the internet much.